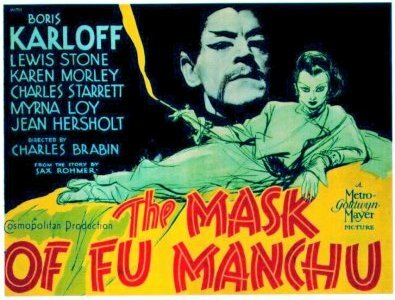 Dr Fu Manchu has been a byword for the grand super-villain since he first appeared in serialised novels by Sax Rohmer in 1912. It’s easy to see why he captured the British public’s imagination - his Asian inscrutability and genocidal hostility toward whites played perfectly into the Edwardian era’s fear of the foreigner in all forms heading into World War One. All manner of untrustworthy qualities and intentions could be attached to a figure who is ‘not British’. Not being ‘one of us’ implies his morality is already suspect. What would such a man be capable of if not gifted by birth to become a well-bred gentleman in the most civilised country on earth? A land of sportsmanship and ‘playing the white man’ with all the imaginary associations that entails? Would he not compensate for his unfortunate cultural upbringing by embracing evil, particularly in a far-off land whose practises we don’t know and are therefore presumed unspeakably barbaric until we educate them correctly by colonisation? There’s gratitude. Good lord, one could work oneself up into an imperial lather at the thought of such lurking malevolence. But seriously, Fu Manchu in his many forms such as cinema, TV and comic books taps into just the same irresistible fictional demonization as the Germans in historic war comics do even today, thrilling the schoolboy and adult alike, but with added far eastern exoticism. Rohmer knew he was on to a good thing when he created the character. Born as the very English Arthur Henry Ward, he began his working life as a civil servant in Birmingham till he could make a living as a writer, initially as a sketch-writer and biographer for music-hall artists such as Little Tich. Eventually, he become a full-time fiction author under the mystical pseudonym of Sax Rohmer. His main inspirations were the fantastical Edgar Allen Poe and more notably Arthur Conan Doyle, with whom he had much in common when it came to shaping and responding to the success of his most famous literary creation. The Fu Manchu plot formula centred around the clashes between this Asiatic megalomaniac and the fine men of the British establishment, namely Dr Petrie who narrated the stories a’ la Dr Watson and Denis Nayland-Smith of the Secret Service, who rose to influence by way of Scotland Yard. As Conan Doyle found with Sherlock Holmes, the association with such a singular creation can be a grinding limitation and instead of similarly killing off his hero, Rohmer simply stopped producing the series after three novels. After a gap of some fourteen years, from 1917-1931, he revived the characters (with a knighted Nayland-Smith) when the novels became lucrative movie translations starring Warner Oland as the titular tyrant in the late 1920s. 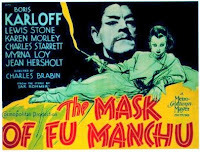 The Mask of Fu Manchu was filmed in 1932 by William Randolph Hearst’s Cosmopolitan Pictures studio, a smart example of business synergy as he produced films that had mainly pre-existed as serialisations in his own magazines (such as Cosmopolitan). This allowed him to publicise his released movies in his magazines and gave studios with whom he had distribution deals prized access to his vast fund of story properties - in the case of this film it was M-G-M.
We are briskly walked into the plot of The Mask of Fu Manchu by an urgent meeting between Sir Denis (Lewis Stone) and Egyptologist Sir Lionel Barton, played by Lawrence Grant, in which the explorer is warned of the critical urgency of his bid to find the relics of Genghis Khan. It seems the power-crazed Fu Manchu wants to get his hands on the sword and mask as well, through which he will become the occult reincarnation of the ancient warrior - and the white man will be slaughtered by a blood-bath emanating from the East. This simply isn’t cricket for the Foreign Office so whitey must get there first. Stone would find lasting fame in Mickey Rooney’s long-running Andy Hardy film series playing his father Judge James. Lawrence Grant went on to appear in the horror films Werewolf of London (1935), as the Burgomaster in Son of Frankenstein (1939) and in Spencer Tracy’s 1942 remake of Dr Jekyll and Mr Hyde. Barton’s mission is soon derailed though when he is chloroformed by masked Chinese kidnappers and presented to Fu himself - Boris Karloff. The Frankenstein star was on loan to M-G-M whilst Universal were still awaiting a suitable in-house horror role for him. However, this new film for their rival didn’t have a finished one either. Karloff recalled: “It was a shambles…For about a week before we got started I kept asking for a script. I was met with roars of laughter at the idea that there was a script”. On the first shooting day he sat patiently while make-up artist Cecil Holland made him up as Fu, transforming him via a long thin moustache, reshaping his eyes and ears, adding Asian eyepieces and long fingernails. It was an elaborate process taking two and a half hours, and even after that the text problems still hadn’t been resolved. He was landed with a dense four-page speech with no time to prepare just before being made up, which I can vouch for as being hideously unfair especially on your first day. After that had been percolating in his mind, upon Holland finishing, he was then given a replacement script now written in offensively pidgin English. This unsatisfactory treatment would be par for the course during filming. Fortunately, in the film all of Karloff’s final dialogue is uttered in silky urbane tones of perfect English, all the more appropriate for a hyphenate of earned doctorates from all the best universities. He actually appears to savour his lines pleasingly, relishing the Bondian bad-guy hospitality with edge: “See that he is quite comfortable – for the present”, teasing Barton with a gratefully-received glass of (actually salt) water and cackling at the cruel joke, the fiend. Even his gorgeous, Western-looking daughter Fah Lo See (Myrna Loy) has her siren-like charms undermined slyly upon her entrance by him: “My ugly and insignificant daughter”. At least The Mask of Fu Manchu’s director Charles Brabin (replacing the sacked Charles Vidor) had money spent on detailed and convincing set design, beginning with the intriguing opening to the tomb guarded by two ornate warrior demons. The expedition party breaking it open consists of the distinguished Jean Hersholt as the German Dr Berg, Barton's daughter Sheila (Karen Morley) her fiance Terry Granville (Charles Starrett), and McLeod (David Torrence). Barton’s abduction means time is even more precious. Berg wastes no time admiring the beautifully-rendered design. “Mac, gimme the axe”. Mcleod is tragically given a weapon in reply that night when a coolie zip-lines into his room while he’s guarding the treasure. He is fatally stabbed while shooting the assassin. I must say a quick word about the lovers who I’d rather had traded places with him. The ‘Yellow Peril’ alert activated by the news of Barton’s kidnapping is certainly embodied by the over-ripe histrionics of Morley. She is a perfect match for Starrett’s Terry, the lantern-jawed, pith-helmeted hero explorer. Her unconvincing wails bounce off his stiff granite determination like bullets twanging off a cliff-face. With their line deliveries proving attention-drawing liabilities as performers, they are made for each other. 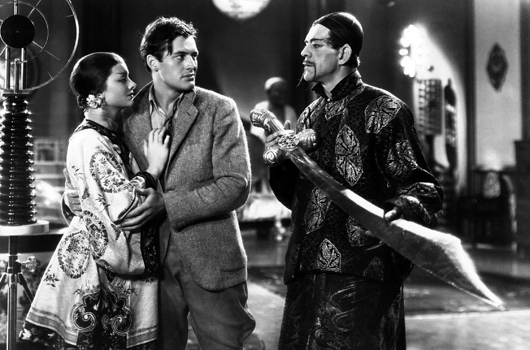 After McLeod’s back-stabbing, Tense Terry sets his chin to ‘stun’ and secretly takes the sword and mask to Fu, hoping to exchange then for Barton. Fu suavely claims Sir Lionel is merely his guest. Fu links the sword up to a crackling Tesla coil to test the sword’s veracity, which is bad news for Terry as it is fried to ashes. Our hero didn’t know that Nayland-Smith (recently arrived) switched a phony scimitar with it. He is whipped mercilessly under the perversely-thrilled gaze of Fah Lo See who is developing the hots for his western integrity. She wants him as a plaything, which Daddy is only too happy to oblige since it gives him the chance to perform surgery and inject Terry with “Dragon’s blood, my own blood, and the organs of different reptiles mixed with the magic brew of the scared seven herbs”. Terry is spaced-out when he returns to the expeditionary camp, numbly pretending to his friends that Nayland-Smith wants the real relics to be taken by him. Sheila’s feminine intuition spots that his acting has suddenly become more naturalistic but they go along to see where he will lead them.She exposes the fallacy in Fah Lo See’s brainwashing, bringing Terry back to his stoic senses by appealing to his deep-seated love for her. This allows Karloff to grandly enjoy announcing even more tortures, including the room of the Golden Peacock for her, and a fiendish sand-timer controlled see-saw poised over a pit of crocodiles for Nayland-Smith. These cliff-hanger threats fondly recall those fun Republic serials of the era, and the climactic use of a million- volt ray-gun by our heroes is pure Dr Zarkhov. The Mask of Fu Manchu made only a small profit upon release. A later 1960s series of films starring Christopher Lee as Fu Manchu fared better. Then again, the disastrous 1979 The Fiendish Plot of Dr Fu Manchu placed a sad final cap on Peter Sellers’ incredible career.